This was a heck of a night to recap the Marlies game. There’s a video many people have watched of AHL player Brian McGrattan getting knocked out in a fight. It’s a tough view for many, and the fans’ behaviour is troubling. McGrattan has played for a laundry list of teams and last had something like a full season in the NHL in 2013-2014. He signed on to the Anaheim Ducks this year as a free agent and has played 36 games for their AHL team. He has 8 points, a decently legitimate number of shots on goal, and 94 penalty minutes. 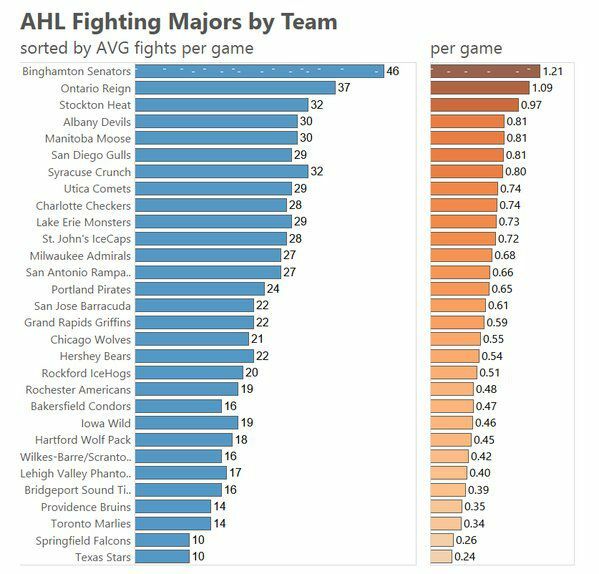 There is a perception, partly based in reality, that the AHL has a fight every game. That’s not really true, but it depends on which teams you watch as to how many you see. This chart is the work of @NHLtoSeatle and you should give a follow if you have any interest at all in NHL expansion or western hockey. “I thought the Phaneuf fight was a big deal for us. We got competing and controlling a lot of the game from that point,” said Babcock. “If you have people in your lineup that are capable of looking after themselves, it’s a real positive. Is it worth it? And who gets to decide? And if we’re worried about the concussion protocols and attitudes in the NHL, then what is happening in the AHL where they are supposed to be following NHL rules? Thanks for all the msgs. Everything is fine i am not dead and will be back shortly!! Been around a long time and know the risks!! Rich Clune is the man known for fighting on the Marlies, and he does; he was involved in the most recent Marlies fight on January 9. Other guys on the team have had fights too. But Clune makes a valid point here. Even he walks away sometimes. Justin Johnson had the one before Clune’s on January 3, and he’s much more a pure enforcer than Clune. Clune’s usually busy playing with serious, offensively-minded guys. Johnson has 8 games so far with 1 point (anyone can get an assist on the Marlies) and 36 penalty minutes. Johnson was literally signed to be good in the room, it should be remembered. But if even the low, low fighting Marlies have more than one guy to take on the role of tough guy or adrenaline booster or fly shooer, when will it ever go away on it’s own? Or do we expect guys like McGrattan and John Scott and Johnson to just move down to the ECHL like Eric Neilson did when Scott bounced off the IceCaps roster. And then we ask what the concussion protocol is there, I suppose. When discussing the incident with Elliott Friedman, McGrattan talked about the fan reaction. …as McGrattan said, it looked brutal. There was the injury, and there was the cheering. “The fans here, they don’t know any better,” was all he said about that. Maybe it’s time we all did. Last weekend we played Where in the World is John Scott. This time, it’s Jonathon Drouin’s turn. Unless you’ve been really out of the loop, you’ve likely heard that the Tampa Bay Lightning sent their talented young forward, Jonathan Drouin to the Syracuse Crunch amidst statements from his agent that he’s unhappy with his usage and wants a trade. A trade seems almost certain, but Steve Yzerman was not hurrying. As a result, the crunch games are buzzing with scouts, more so than usual. Drouin has 2 goals and 1 assist in 7 games so far and 16 SOG. That’s not Nylander or Arcobello territory for shooting, but it’s not bad. Jonathan Drouin has been suspended indefinitely without pay after failing to report for tonight’s Syracuse Crunch game vs. Toronto. So no Drouin for the scouts to watch. I don’t think the Marlies will be unhappy with the scrutiny of all those bored scouts. Watch for our own take on the Marlies UFA players and their trade prospects coming soon. There are some new faces in town! Defenceman Eric Baier and forward Rylan Schwartz were called up from the Orlando Solar Bears and signed to PTO contracts so they can play. Both have some AHL experience, but if they draw into the lineup, they’ll be making their Marlies debut. Baier is the captain of the Solar Bears, and they are a small squad spread very thin right now without these two and Éric Faille who is already with the Marlies. Defencemen Stuart Percy and Justin Holl were both injured on the weekend and are unlikely to play. The game opened to some furious action. Both of these teams are fast, hard-playing sides that play to win. Kristers Gudlevskis, in net for Syracuse, had to work, making some key saves right away. Both of the new callups were in the game for the Marlies, and along with Faille and Brett Findlay, that made four Solar Bears in the lineup. None of them looked terribly out of place, but the drop from Marc Arcobello at 1C to Ryan Rupert on the second line was pretty steep. The up and down action continued for 10 minutes, with the Marlies leading 9-4 in shots on goal. The Marlies took a classic, fairly foolish, holding penalty on a Syracuse rush. Antoine Bibeau dumped a Crunch player in his crease on the delayed call and got away with it, but on the power play itself, he let in a dribbler that did not make him look good at all. Viktor Loov, on the ice with T.J. Brennan and the Arcobello line, got an opportunity to take a beautiful pass and put it right past Gudlevskis. They looked like they were on the power play. The goal was Loov’s first of the year, and the pass from Brennan put him on top of the AHL scoring list. It might not last, but he’s a defenceman and he’s leading the league in points. Amazing. At the end of the period the shots were 14-11 for the Marlies, with a tie game. The Crunch came out and took over the first half of the second, evened up the shot clock and hemmed the Marlies in. But they took a penalty for roughing. The Marlies played a great power play with lots of chances, and as it ended, Faille had a very good scoring chance when the penalty killers got stuck on the ice. The Marlies had found their feet again. The play stayed dead even in the second, and Kasperi Kapanen got all out hearts pumping when he turned on the turbocharger and outskated a Crunch D and made Gudlevskis come out to play the puck. It’s obvious in hindsight–like most things are–that he was really not well at the start of the year. The Crunch got the go-ahead goal in the last minute of play on a rush by Cameron Darcy, when Bibeau seemed to be expecting a pass. In the third, the Marlies were getting a little sloppy, and three goals came in a minute an a half. Arcobello got the first on an excellent shot, but two for the Crunch put them up 4-2. Nikita Soshnikov and Zach Hyman, who were playing with Arcobello and were fantastic all night, got it to 4-3 with a great move by Soshnikov to keep control of the puck and shoot it in for Hyman to get a goal off the rebound. This top line started to get a lot of icetime in the last few minutes of the game. They had a frantic flurry with Brennan working as the fourth forward, and Gudlevskis was under seige, but he weathered it. The Marlies were not having a good time of it near the end of the game, and I was resigned to seeing them drop this one, when the Marlies interrupted a Crunch pass, and then Arco! Bello! came over the boards, outskated the D (not quite as fast as Kapanen), took the puck in and no doubt, that was going in. Beautiful game tying goal. Bibeau made a sort of lazy play on the puck into the corner a few seconds later which the Marlies didn’t clear, and he had to make a couple of very good saves when the Crunch picked it up and got off two good shots. To OT. OT was short and very sweet, with Brendan Leipsic coming out on the first change obviously ready to dish and dance with the puck. He tried one move, was denied, and then Rupert without a stick behind the net kicked the puck out and Leipsic spun once, shot the puck and in. Game over. Marlies win 5-4. Don’t they always? It seems like they do. The next games are a weekend afternoon series against Utica. Hopefully, nothing other than hockey occurs, but you never know. Maybe Vancouver will send down a Sedin or something.